When Colorado mom Melissa Weisner was faced with planning a birthday party for her geology-crazed 6 year-old son, she took nothing for granite (ba DUM bum). It all crystallized for her when she began thinking about a game. She developed one and rolled it out at her son's party to great reviews from him and his friends, and now ROCK ON! is being shipped to kids everywhere via Amazon. 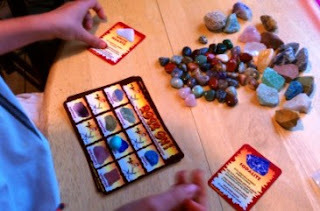 My kids got a chance to play (we received a sample in exchange for writing an honest review). They had never expressed interest in rocks before (unless we're talking about a Jonas Brothers movie) but they sat and played together nicely, trying to figure out how to pronounce words like "anhydrite" and "septarium." Melissa says,"Since the birth of ROCK ON! my children’s fascination with the earth's elements has resulted in some amazing collections and their geology knowledge is equally amazing. But maybe most important of all, some of our best times together are now spent in nature looking for treasures the earth has to offer." I intend to take the rock love outside the next time we're out trekking. In the meantime, ROCK ON! 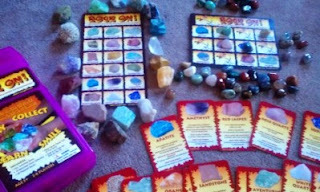 is a recommended introduction to geology for kids, sure to cement their interest in geology. Video clip from Channel 's Colorado's Best. very cool! Liam studied geology last year and this would have been a perfect addition for some extra home study. I'll be sure to check it out. Do the rocks come with the game? Yes! One bag of raw rocks for studying, and one bag of polished rocks to use as game markers.